The Custom Pure MB Series Filters are designed for people who want high purity, fluoride free, drinking water; and who's tap water has low mineral content, similar to our water quality in Seattle. You can have water quality similar to that produced by distillation or reverse osmosis but without using electricity or wasting water! The MB Series uses deionization resin, a filtration medium commonly used by the electronics and biomedical industries when ultra pure water is needed. Custom Pure combines this ion exchange technology with activated carbon adsorption to produce delicious tasting "distilled" quality water. The MB Series filter has been designed specifically for use on water supplies similar in quality to that found in Seattle. We have a variety of sizes to meet different capacity needs and we offer three different installation styles to best accommodate your available space. *Contaminant removal is defined as contaminants not found in filtered water at lowest detectable level in third party testing. Available upon request. Note that the MB Series Filter is intended for use on microbiologically safe water. If it is to be used on water known to be microbiologically unsafe, the ultraviolet sterilizer is additional required equipment. All models are portable and can go with you when you move. Variety of sizes to meet your capacity needs. A variety of dedicated faucets to choose from. Large diameter fittings maximize flow rate (usually greater than 1 gallon per minute). Superior housing and installation materials provide "no-leak" peace of mind. 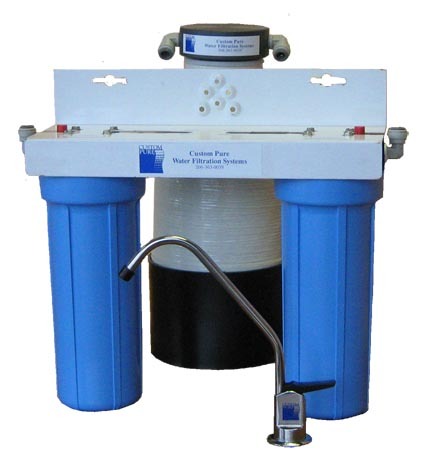 Adjustable to accommodate future changes in water quality or capacity needs. Automatic notification when your filter is due for servicing. Free water testing for monitoring filter performance. If you are in our area, we invite you to come to our store and see the filter and its installation for yourself. Or Contact us to schedule installation (greater Seattle area only) or shop online. Five models are available. The following links will take you to detailed product descriptions in the shopping cart where you can purchase these products. To return to this page, use your browser's Back button. *This estimated capacity is based on use on the Seattle water supply. If used on water sources with higher mineral content, the capacity may be markedly reduced. How much water do you use? On average a 1-2 person household will use 500 gallons of drinking and cooking water in one year. A 3-4 person household will use about 1000 gallons while a 5-6 person household may use about 2000 gallons. If you are not sure what size filter will give you sufficient capacity, simply ask for a free water consultation.